Professor Sachs served as the Director of the Earth Institute from 2002 to 2016. He was appointed University Professor at Columbia University in 2016, and also serves as Quetelet Professor of Sustainable Development, and Professor of Health Policy and Management at Columbia University. He is Special Advisor to United Nations Secretary-General António Guterres on the Sustainable Development Goals, and previously advised both UN Secretary-General Ban Ki-moon Sustainable Development Goals and Millennium Development Goals and UN Secretary-General Kofi Annan on the Millennium Development Goals. He is a Distinguished Fellow of the International Institute of Applied Systems Analysis in Laxenburg, Austria. 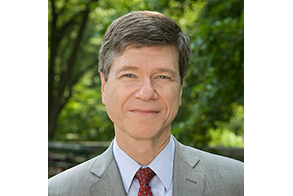 Sachs is Director of both the Center for Sustainable Development, and the UN Sustainable Development Solutions Network under the auspices of UN Secretary-General Ban Ki-moon. For more information, contact Blanca Ripoll at (305) 284-5206.